Residues from pharmaceuticals and especially active pharmaceutical ingredients (APIs) in ground water, water courses and drinking water have become a source of increasing concern in recent years. 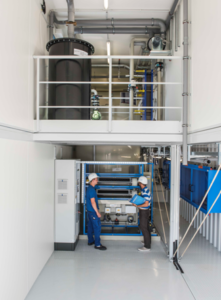 Water treatment specialist EnviroChemie has developed a range of advanced processes for the successful removal of activated pharmaceutical ingredients from wastewater. These include advanced oxidation processes (AOPs) such as Envochem® AOP that provide chemico-physical solutions for removing the residues of active pharmaceutical ingredients (APIs) or endocrine disruptor chemicals (EDCs) from wastewater. The World Health Organization (WHO) has confirmed that over the past decade increased traces of pharmaceuticals, typically at levels in the nanograms to low micrograms per litre range, have been detected in the water cycle, including surface waters, wastewater, groundwater and at trace levels in drinking-water. The main concern is not the strengths of these traces, which remain well below the concentrations considered to pose risks to human or animal health, but their increasing prevalence across a wide range of water sources. While some of this increase can be attributed to advances in analytical technology, their presence in water, even at very low concentrations, has raised concerns among stakeholders, such as drinking-water regulators, governments, water suppliers and the public, regarding the potential risks to the environment. Since raw sewage and industrial wastewater effluents are major sources of pharmaceuticals found in surface waters and drinking-water, it is important to consider and characterize the efficiency of processes for the removal of active pharmaceutical ingredients. Conventional filtration wastewater and drinking-water treatments are not designed specifically to remove pharmaceuticals but may do so to varying degrees. Conventional wastewater treatment facilities generally have activated sludge processes or other forms of biological treatment such as biofiltration. These processes have demonstrated varying removal rates for pharmaceuticals, ranging from less than 20% to greater than 90%. The efficiency of these processes for the removal of APIs is largely dependent on operational configuration of the wastewater treatment facility. Factors influencing removal include sludge age, activated sludge tank temperature and hydraulic retention time. Studies of conventional drinking-water treatment processes have also shown that coagulation is largely ineffective in removing pharmaceuticals. Free chlorine is able to remove up to approximately 50% of the pharmaceuticals investigated, whereas chloramines have lower removal efficiency. Compounds that showed high removal by free chlorine but low removal by chloramines include antibiotics, such as sulfamethoxazole, trimethroprim and erythromycin. Comparatively, advanced wastewater treatment processes, such as ozonation, advanced oxidation, activated carbon and membranes (e.g. nanofiltration, reverse osmosis),can achieve much higher removal rates for pharmaceuticals of above 99% for targeted pharmaceutical compounds. Envochem® AOP plants are widely used in pharmaceutical industries for chemico-physical water treatments. These can include emulsion splitting of process water, detoxification of wastewater or removal of heavy metal residues. Envochem® plants incorporate a range of processes, separately or in combination. These can include precipitation, flocculation, sedimentation, activated charcoal adsorption and neutralization or oxidation using ozonation, hydrogen peroxide/UV, photocatalytic and other advanced oxidation processes. Advanced oxidation processes (AOPs) are chemical treatment procedures that use oxidizing reactions with OH hydroxyl radicals to remove organic and some inorganic materials from water and wastewater, able to reduce contaminants from several hundred parts per million (ppm) to less than five parts per billion (ppb), producing water which is practically pure. Advanced oxidation is particularly useful for scrubbing non-degradable toxins such as volatile organic compounds or aromatics from wastewater. They can also be used in tertiary treatment of previously filtered wastewater to reduce chemical contamination to the point where cleaned wastewater may be safely reintroduced into the environment. EnviroChemie has modularized its AOP solutions for chemico-physical water treatment as Envochem® AOP plant packages. EnviroChemie has been developing and supplying oxidation plants for wastewater treatment since the early 2000s. Depending on application, various processes such as UV systems, ozone systems or chemical oxidation are used as the basic process. UV oxidation systems have proven themselves in recent years for the destruction of active components from pharmaceutical products (API: activated pharmaceutical ingredients and EDC: endocrine disrupting chemicals) and are becoming increasingly prevalent. Extensive preliminary investigations in laboratory or pilot tests are a prerequisite for the good, economical function of oxidation systems, particularly in UV systems which use hydrogen peroxide as an oxidant. Beside the active ingredients, the pharmaceutical wastewater to be treated contains a variety of organic compounds, which can be easily treated in the company’s own sewage treatment plant or the municipal sewage treatment plant. Depending on the strength of the total organic load (COD: chemical oxygen demand), the oxidant is increasingly consumed by the organic substances which are not actually intended for reduction. Only a precise selection and combination of the appropriate UV radiation sources, the design of the UV reactor overflow, the dosage of the oxidant and the treatment duration are important for a good and economical result. The EnviroChemie Envochem AOP system series is based on a batch treatment in single or dual batches in reactor sizes between 2 and 20 m³. The UV radiation sources are installed as pipe modules beside the reactors and are continuously flooded with a pump loop. The oxidizing agents are also automatically added directly to the circulation loop and can be variably adjusted. The plant is controlled via an EnviroChemie ASIC process control system with process visualization on a touch panel. Data transfer to a central computer process control is possible, as is remote maintenance by EnviroChemie via the Internet or the establishment of an electronic operating log system. The EnviroChemie technology center is comprehensively equipped for laboratory and pilot tests. Click on Removal of APIs from water for other information. Click on Envochem AOP treatment for the video.